We are Blooming in Fort Collins! Please join us on September 27th with our event hosts Courtenay Daum, Erika Strote, Rachel Olsen, Tricia Canonico, and Staci Clark for an incredible evening celebrating female leadership in Fort Collins. We are Blooming in Boulder! Please join us on September 27th at the home of Rep. Edie Hooten for an evening of celebration in Boulder. We are Blooming in Arvada! Please join us on September 18th at the home of Rep. Tracy Kraft-Tharp for an evening of celebration in Arvada. 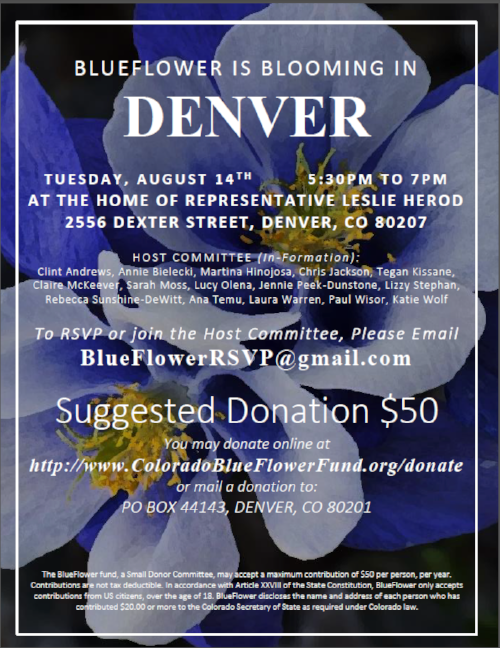 Join Colorado BlueFlower Fund at the home of Rep. Leslie Herod as we work to support all of the pro-choice Democratic female candidates in Colorado as they go on to face the election this fall.